Kappa Kappa Psi Graduation Cords are in the same colors as the official colors of the National Honorary Band Fraternity: Blue and White. Blue and White Graduation Cords are more specifically royal blue and white, and are braided honor cords. Kappa Kappa Psi Graduation Honor Cords are also double cords. So, the cord is a royal blue with white braided double honor cord. The tassels on the end of each graduation cord are half blue and half white. 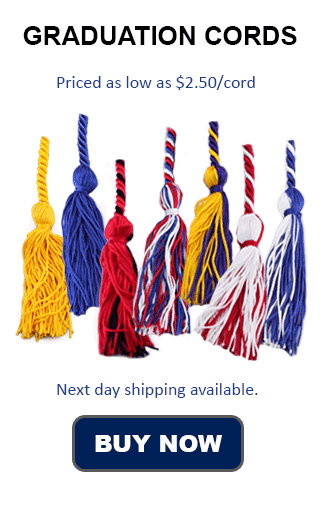 When you order Royal Blue with White Graduation Cords from Honors Graduation, you know that you are not only getting a quality honor cord, you will also get it on time. This is very important for time sensitive products like graduation cords, where they are needed for graduation ceremonies or award banquets. We offer a variety of shipping options, including overnight delivery and our flat rate shipping option that will get your order to you in 4-6 days, no matter what the size, for one low price. Kappa Kappa Psi was formed in Stillwater, Oklahoma at the Oklahoma Agricultural and Mechanical (A&M) College in 1919. Since then the name of Oklahoma A&M has changed to Oklahoma State University. Unlike many Fraternities, Honor Societies and Sororities Kappa Kappa Psi (KKPsi or KKY) is still headquartered in the city it was founded in. KKPsi is a leadership recognition and student service society for Band members in Colleges and Universities across the nation. There are currently 210 active chapters of KKY and 6,000 collegiate members. Tau Beta Sigma is the name of the Kappa Kappa	Psi's sister organization, and is an honorary band sorority.